One year ago today I started this blog for my passion on toys. Through my journey of blogging, I have since reaped many rewards. Since this is exactly one year (1st Anniversary), I would like to give some updates about this blog and share something with you at a personal level. Toy blogging has given more meaning to my toy collection. I used to play with my toys but as I grew up pounded hard by the expectation as an adult and cold reality, I lost much of the joy for being creative and imagination such as making up stories. With toy blogging and photography, I found a new release in my imagination and creativity with toys. Some of you may notice that I have not been doing much of my toy reviews. 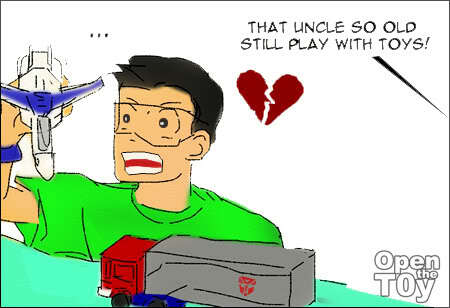 That is because I do not have much budget to buy new toy am quite tired up with some family and work commitment. 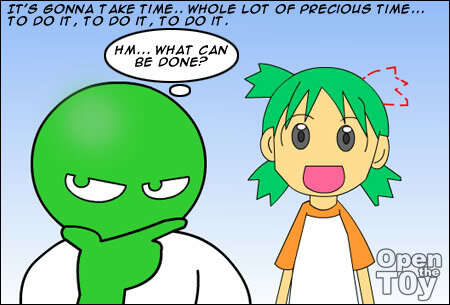 I would like to apologize for the amount of project I have spoken but yet to get it done such as setting up of Hoi hoi-san figure, replacement hair part of my yotsuba and more stories of OTTi. These are constantly on my mind but after meeting each day challenges, much of my energy were drained away. Nevertheless, some things are set into motion (Look out for this weekend post) and I hope for the next month, I will be more free to come out with more fun content. Your understanding and constant support (like commenting) are always appreciated. This is perhaps the most tangible reward for the entire year of blogging. I am grateful to know that I am not alone in the world in the toy blogging. Friends has open me up to a bigger world. Through blogging I met toy bloggers, collectors, resellers, toy model kit makers, 3D animators, Anime lovers, Toy customizers, Cosplayers, Photographers and even Musicians around the world. I would like to thank all my readers and bloggers for their support in subscribing to my RSS, following me on Twitter, putting link to this blog, participation in my quiz and giveaway, joining my group outings and events and most of all leaving interactive comments to show that you care. This blog will not be the same without you. Thank you for being there for "Open The Toy" and me. Happy birthday OTT! I see our blo header there, LOL. Bring out the party hats! Happy anniversary as well, dude. Been a while since lesleon, eh? Haha. Thank you for the wishes. I hope too. HAPPY BIRTHDAY OTT! It was a real pleasure reading and supporting your blog. As age catches up i too wonder if i will quit this hobby! Super brave "uncle" continuing his passion = Salute! Thanks for your constant support bro. 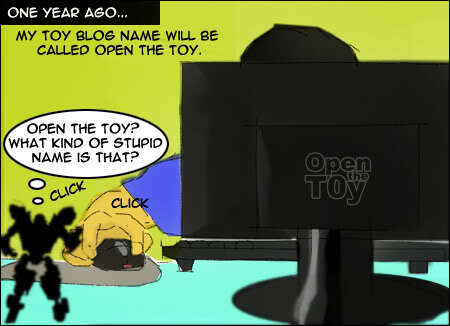 Happy one year anniversary to 'Open The Toy'. My honour to be part of your blog journey. Only a year old, seriously quality blog for that short a time. Really impressive and one of the first i discovered. Heres to another year, CHEERS! Congrats dude, yeah I know it's hard to maintain a website. I done it for 5 years and encountered so many issues from being hacked serveral times to left it to root for almost a year before. Was great to meet you at AFA09 and I promise I will return to Singapore next year. Happy Bday Open The Toy! And woohoo! 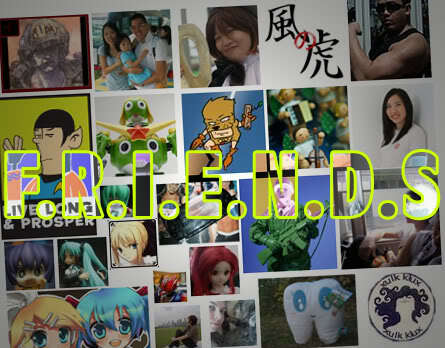 I made the cut in the friends section! lol! By the way, nice drawings! is a dutch celebration songs. very good you made this first year i hope many years will follow. Sorry for the late comment, but anyway, happy birthday OTT! It's always fun to visit your blog! Thank you. It's fun to read your blog too. I love the temple photo shoot. Very exotic.